Nick Ripatrazone’s novella, This Darksome Burn, is available from Queen’s Ferry Press. His debut collection of short fiction, Good People, is forthcoming in 2014 from Foxhead Books. His writing has appeared in Esquire, The Kenyon Review, Pleiades, The Iowa Review, Colorado Review, and The Mississippi Review, and has received honors from ESPN: The Magazine. Nick can be found online at www.nickripatrazone.com. His “Cribbing Collar” received honorable mention in this year’s Bevel Summers Contest. Edward Hirsch notes that persona poetry originates “in archaic rituals where masks are independent beings that possess the ones who assume them,” resulting in the animistic “displacement of the poet’s self into another existence, a second self.” Hirsch quotes W.B. Yeats that the poet “never speaks directly as to someone at the breakfast table, there is always a phantasmagoria.” Each poetic or imaginative act is a form of persona, but persona poetry is the acknowledgment of disruption of the self’s shape, like a phantasmagoric, lantern-projected image onto an uneven rock wall. 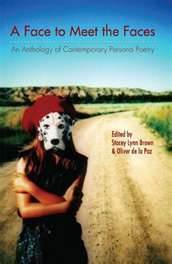 A Face to Meet the Faces offers nearly 500 pages of persona poems arranged by both content and theme. Sections include historical figures, characters from mythology, folklore, popular culture, religious figures, fairy tales and other imaginative literature, as well as adoptions of the voices of poets and fiction writers. The editors have compiled a generous sampling of both established and emerging voices. Blas Falconer documents Diego Salcedo’s 16th century murder that preceded the Taíno rebellion. Tony Trigilio channels Lee Harvey Oswald’s confession to his father. Kazim Ali renews the Icarus myth. Jericho Brown performs as Diana Ross in “Track 4: Reflections.” Cornelius Eady elegizes Emmett Till through the young man’s glass-top casket. Patricia Smith braves the hate of a skinhead who has “my own beauty.” Susan Rich’s midrashic “Sarah’s Story” compliments the treatment of Isaac by William Robert Flowers. Philip Memmer shares a new magician’s assistant hopes to better her predecessors who have worn “the same short sequined dress.” The collection spans moments of seriousness and absurdity, all glued by the transformative act of persona. The poems of Oppenheimer and Canaday share content: several men on horseback crossing a river, a moon lost behind mountains. Phrases are nearly replicated: Oppenheimer’s “ranges barring the sky” has become “High slopes / barring the sky.” Yet Canaday’s divergence from Oppenheimer’s original poem creates a successful work of persona. Oppenheimer’s poem was written long before the reality of the Manhattan Project, and could be set anywhere in the Southwest. Canaday’s version is set on the Rio Grande, so that the riders see their boatman in the shadow of the bomb’s development. Oppenheimer’s boatman “called to us”; Canaday’s boatman sleeps. It is the riders, not the boatman, who “called farewell,” and only the “tamarisks replied” with “salty breath” before their “dry leaves . . . flickered like candles / and went out.” A soft ending to a poem about a man instrumental in developing a most dangerous weapon. Visitors to Whitman’s 1891 birthday celebration included the painter Thomas Eakins, who, speaking of painting Whitman, said “ordinary methods” were insufficient; “technique, rules, and traditions would have to be thrown aside; that, before all else, he was to be treated as a man.” Whitman’s confidence and voice threatens to burst through Nienow’s own words. Not bound to the real, A Face to Meet the Faces also offers fictional personas. “Pinocchio’s Elegy for the Unreal” by Ariana-Sophia Kartsonis offers a continuation of Carlo Collodi’s serialized novel. In the novel, still-marionette Pinocchio is chased by assassins, and seeks refuge in the house of a “lovely maiden” who claims she is already dead, simply “waiting for the coffin to take me away.” Once Pinocchio is captured the narrative turns from sardonic to violent: the marionette is lynched, but as an unreal child, death is not possible. Pinocchio is taken down and wrapped in sheets. One of the doctors summoned, the Talking Cricket, calls Pinocchio “a rascal of the worst kind . . . rude, lazy, a runaway,” but he survives. The poem ends with a return to Geppetto’s workshop, where “every old tool dreams of your hands, / your smoothing grip.” There, “veiled with cobwebs,” a spider “unlaces a luna moth, a dinner / too huge, too gossamer to be real.” In these final lines, the poem and novel coalesce, reaching another layer of story. Such conversation between poem, precedent, persona, and variations might be the best result of A Face to Meet the Faces, and of the persona act. Hall posits that Dickey’s usage of persona might be an act of poetic cowardice, saying “we want him to try to find out what it means in his own life.” He finds that Dickey “does not accept the risk of his search . . . Instead, he uses a persona as a way out.” Such criticism might be valid in a particular, political realm, but the act of persona poetry is not the avoidance of the “I,” it is an acceptance and qualification of the “we.” Empathy–poetic or otherwise–is not easy, and the dramatic monologues of persona poetry offer valuable experiences for both reader and writer. Distortion of truth and identity is good for the breakfast table, as well as the page.